On a recent visit to Israel, I was invited by David Perlmutter to present a tasting on wines made from Carignan. This is a variety of which I am very fond, but, living in Provence means that, whereas 30 years ago I may have tasted a fair amount of this variety, today it here is rarely available. It is not popular, or is not successful, in rosé wine, now nearing 90% of Provençal wine production. In red wines, the once standard trio of Grenache, Carignan and Cinsault is steadily becoming subservient to the stronger flavours of Mourvedre, Syrah and, to a lesser extent, Cabernet Sauvignon. So I was very excited by the chance of tasting a few varietal Carignan wines. 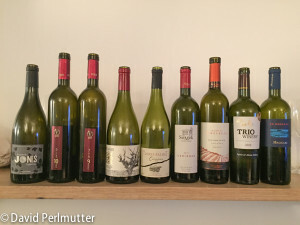 I was able to discuss the variety’s potential with local winemakers – Assaf Paz, Yotam Sharon, Kobi Arviv and Barak Dahan were all present to present their wines, as well as Adam Montefiore representing Carmel. Carignan is experiencing a small revival in Languedoc and Chile and now it looks like its reputation is growing in Israel.